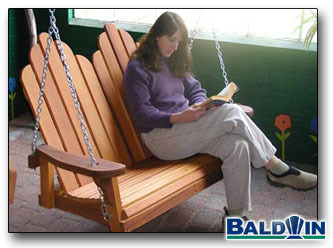 The Swing comes with enough chain to reach an eight foot high porch rafter or tree limb. If you need to go higher just let us know and we will add more chain to your swing. The good thing is that this is not a kit. We completely build, sand and seal the Swing. Then we take the backrest off so it can fit into the UPS size limit. Your assembly is about two minutes, and we include the square drive screwdriver!